A personalized gift sure to please...Sew Be It Embroidery by Bev! Sew Be It by Bev is an independently owned small embroidery business with big business capabilities. It's all about personal attention, quality products, and superior workmanship. ****Our site is still under construction**** Please contact Bev if you have any problems ordering or if you have questions. Thanks for your patience!!!!! Here's a sampling of what we offer! Taggy Lovey's are interactive security blankets babies adore. Ultra-soft and luxurious, Taggez are made of the most comfy, Minky fabric imaginable that feels so good against baby's skin. Each one is buttery-soft and boasts grosgrain ribbons for your child to hold on to. 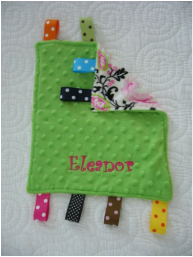 These make great baby shower presents and newborn baby gifts. They are often used to soothe baby while nursing or napping. Perfect size for a burp pad or a lovey. 100% cotton superfine twill sun hat, cotton poplin lining, six-panel rounded crown. 3" hat brim, 1/2" wide chin strap with velcro closure. Soft and Snuggly... just like baby! Generous 30" x 40" blanket is soft and fluffy microfiber on one side while the opposite side and binding are done in polyester satin. As with all of our products, it is machine washable. 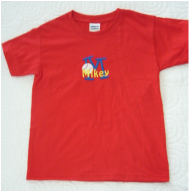 100% preshrunk cotton tshirts and onesies are available in kids, toddler and infant sizes. Choose from embroidered name, monogram, BOTH, and appliques! Online shopping for all of your personal or gift-giving needs...embroidered especially for you...by Bev! Everything we sell is CPSIA compliant. We will also embroider items you own. Just contact us and we'll give you a quote! Embroidered items cannot be returned. All sales are final.